I’m sure many of you are coming down from your Olympic high. I’m not normally a huge sports fan but for the past 3 weeks, you wouldn’t know it. I was filled with Canadian pride while cheering hard for the home team. I’m still pumped about our gold medal wins in both women’s and men’s hockey so it only seems appropriate to dedicate this week’s posting to Canada’s game. If you play hockey, or have had the pleasure of living with someone who plays hockey, you can understand how bad the equipment can start to smell. 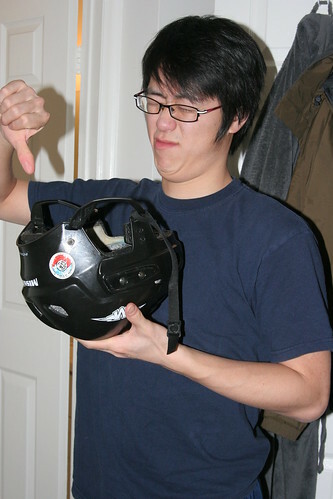 Now my friend’s helmet had about 3 years of sweat accumulated inside of it and smelled so bad that he was considering just purchasing a new one altogether. So I suggested that he give Soak the chance to save the helmet and use the money he saves to take me to dinner. Now the helmet and gloves just float on the surface so we had to dunk it down every once in a while. You could just put something heavy on top to keep them submerged in water while they soak. Now there are mixed reviews on whether or not you should submerge your helmet in water as some of the adhesive may loosen. So although I did it with much success, please try this at your own risk. I figured, while we were at it, the hockey gloves could also use a good cleaning. In hindsight, we should have just filled up the whole tub and threw in all the equipment. Now I did read that most hockey gear can be thrown in the washing machine, however, hand washing will prolong its life. Considering how expensive hockey gear can get, the longer you can make it last, the better. Look at how brown that dirty water is! To think, all that was from his helmet and his gloves! GROSS! 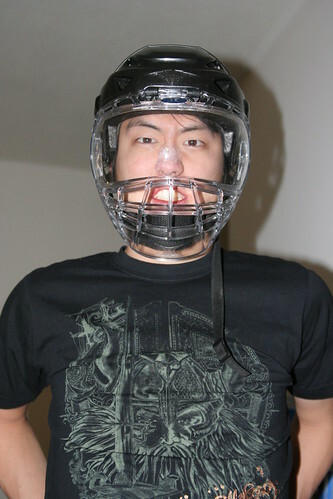 Here he is wearing the clean helmet and ready to hit the ice! Now although soaking it did get rid of almost all of the stench, if you sniffed really closely, you could get a hint of some lingering odors. A second soak may take care of this, but compared to how awful the helmet and gloves smelled beforehand, I’d call it a great success. Try it for yourself and tell me about your success stories. I like the labeling on this product. TV commercials would do wonders for Soak. This is great cross promotion with American Idol right now. How did you get Jon Park as the soaksperson? I like how this blog doesn’t sound like an infomercial. It feels like Jon Park really does use Soak. 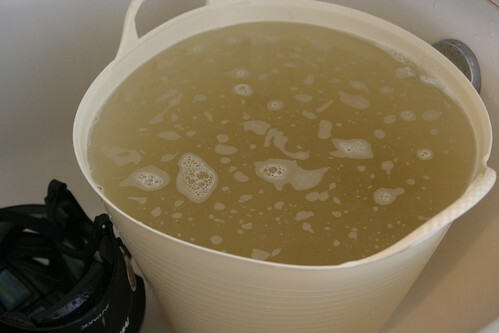 I usually use bleach diluted in a lot of water to clean hockey equipment. Perhaps if you mix in a little bleach with the soak it might take out all the smell?